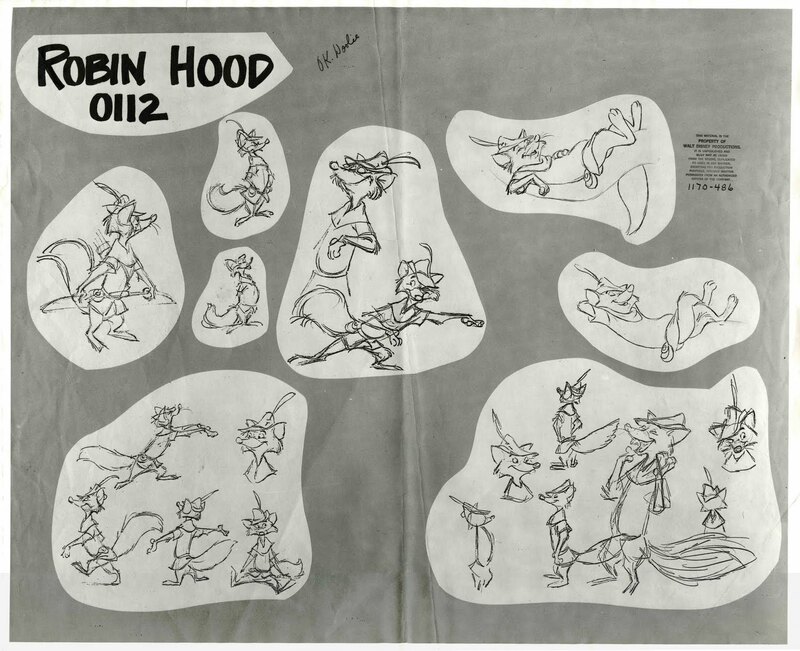 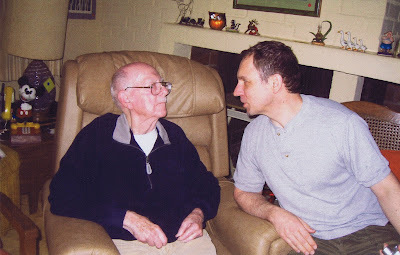 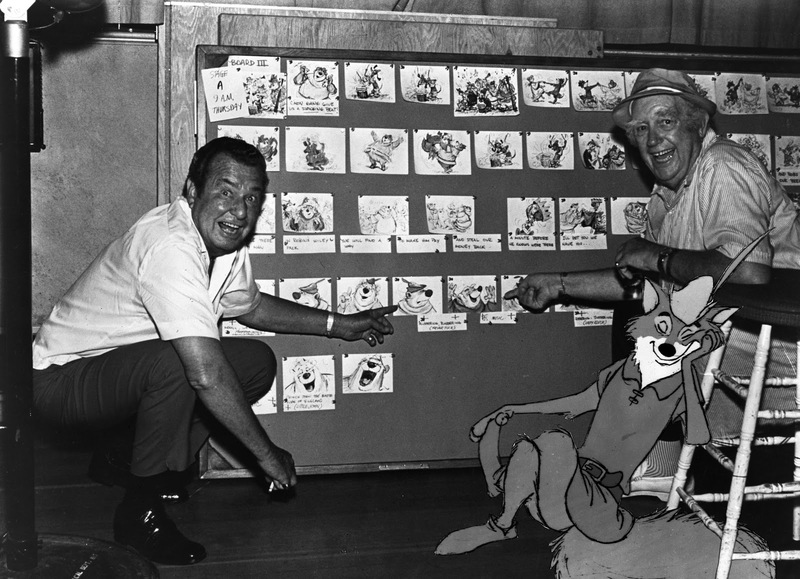 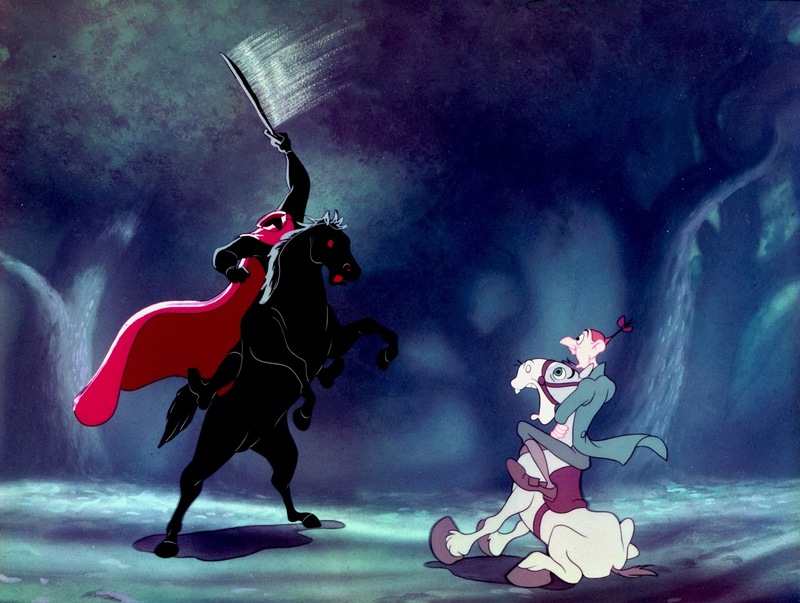 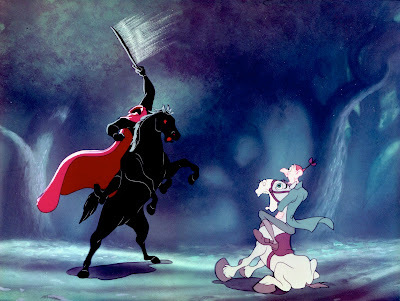 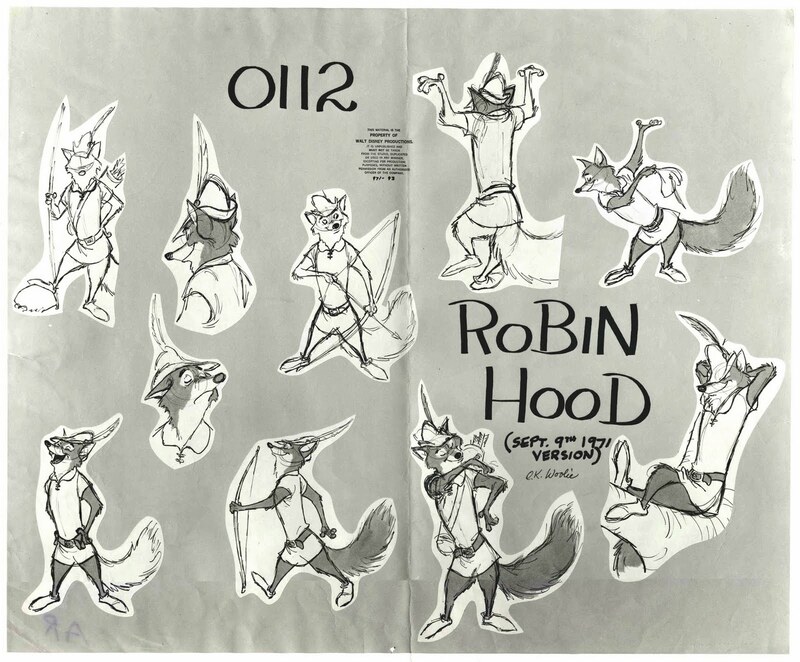 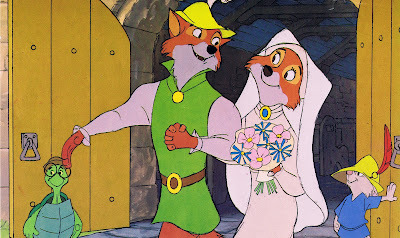 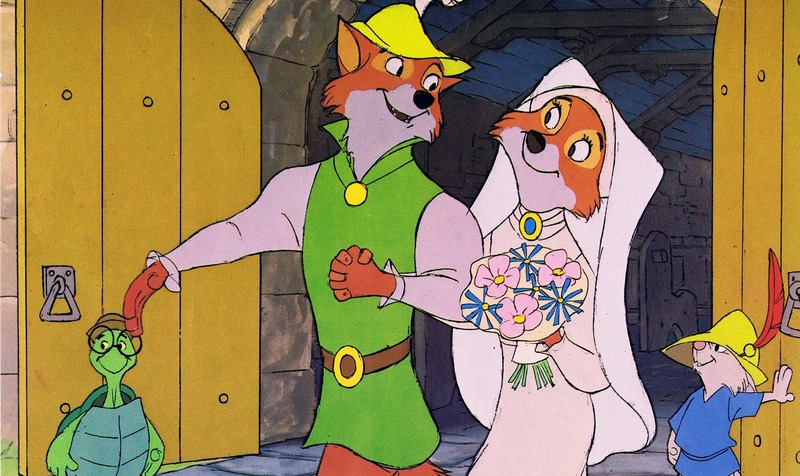 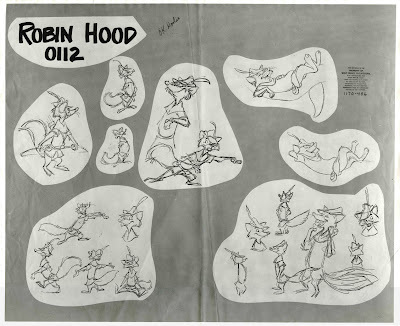 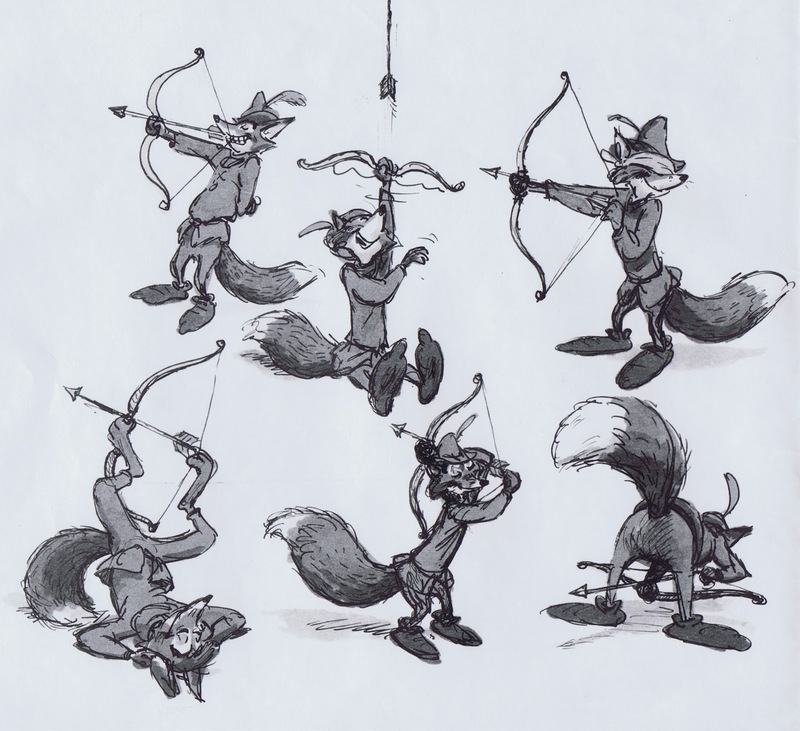 When Walt Disney Productions decided to produce an animated film based on the classic tale of Robin Hood, it was Ken Anderson who who got to get to work before anyone else. 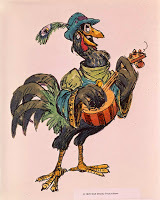 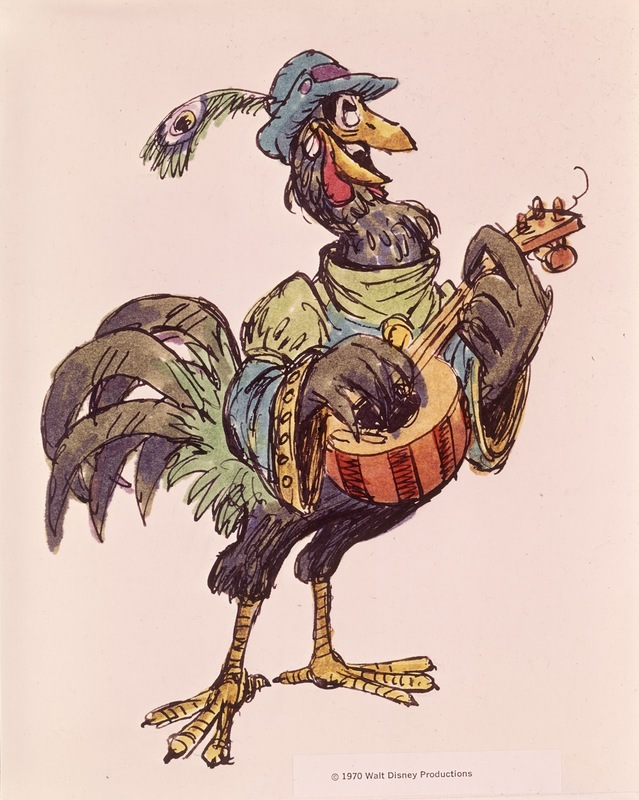 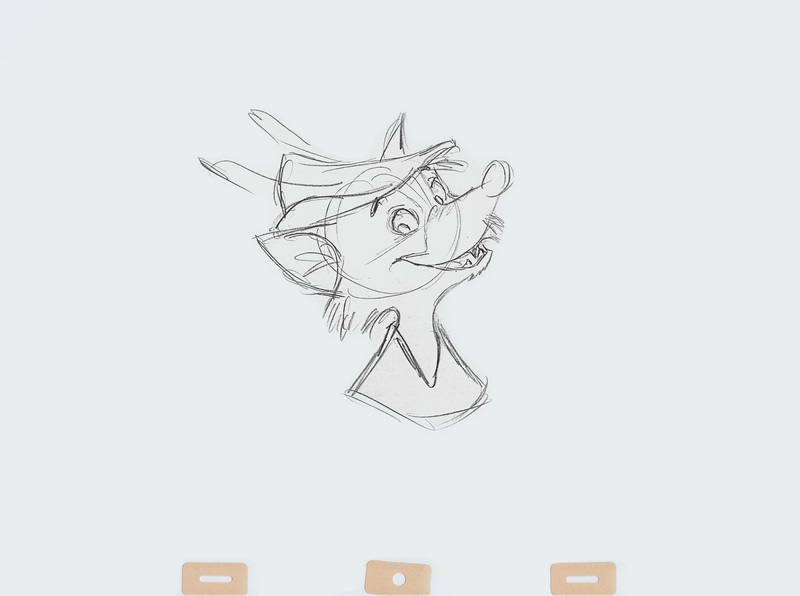 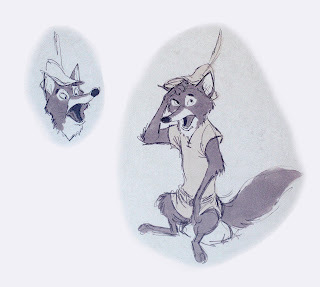 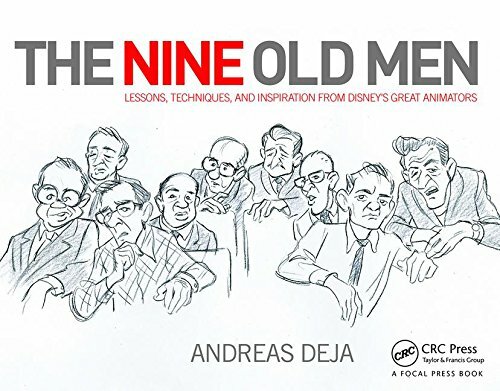 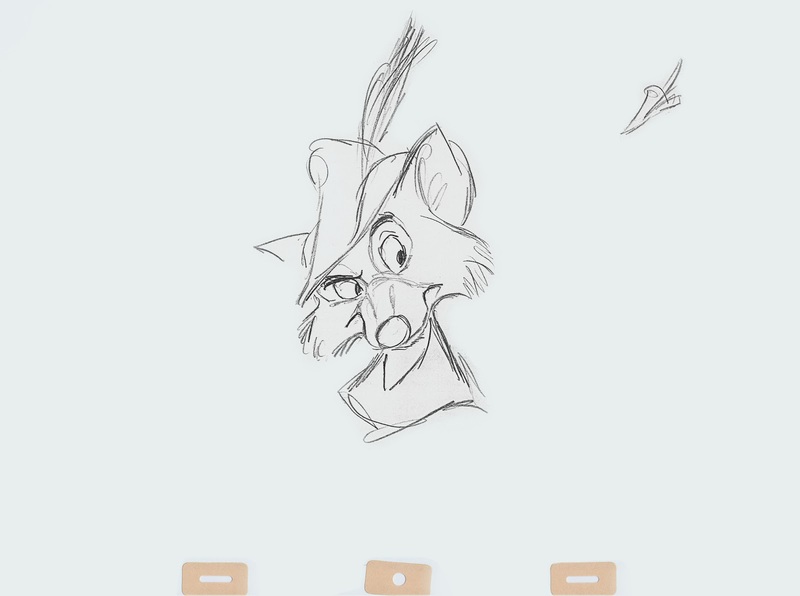 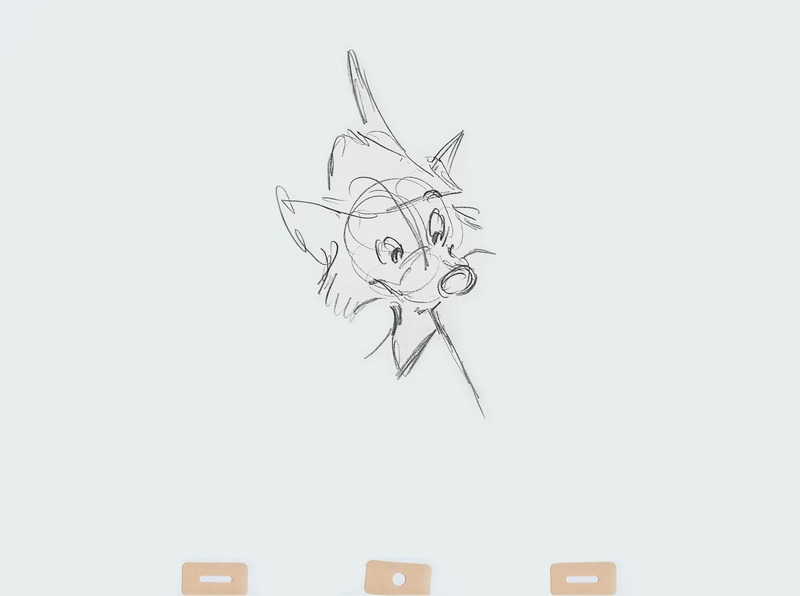 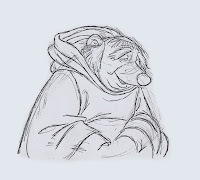 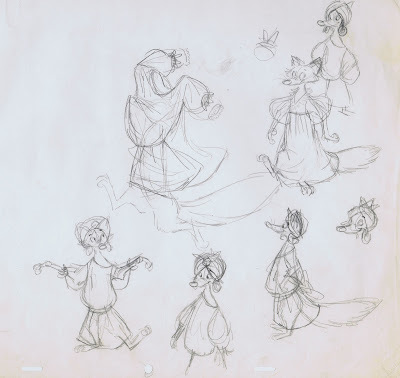 During conversations with the animators Ken found out that some of the most fun they ever had was animating the anthropomorphic animals in Song of the South. 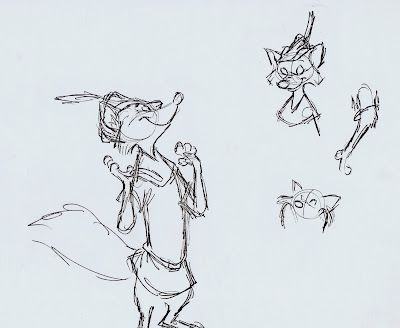 So he suggested that the story of Robin Hood be told with animal characters. 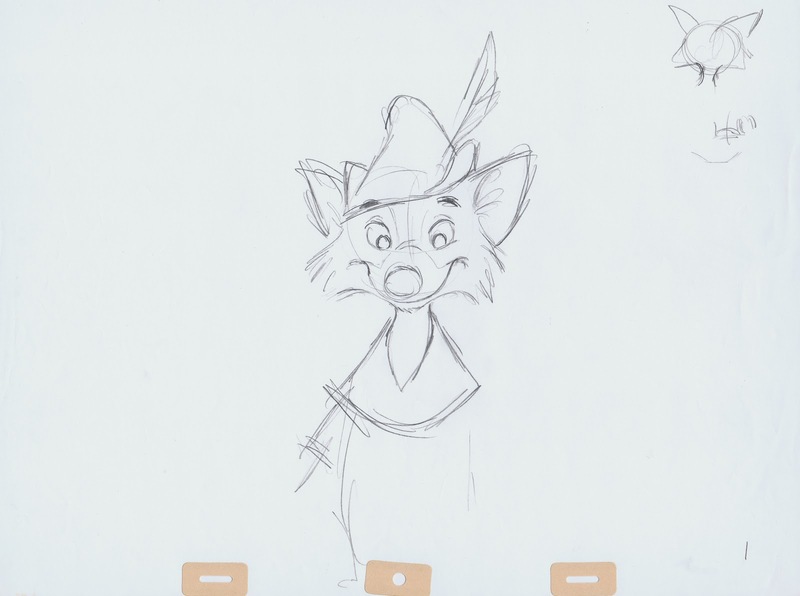 Everybody loved the idea and after completing early design work Ken presented his research to some of Disney's top talents. 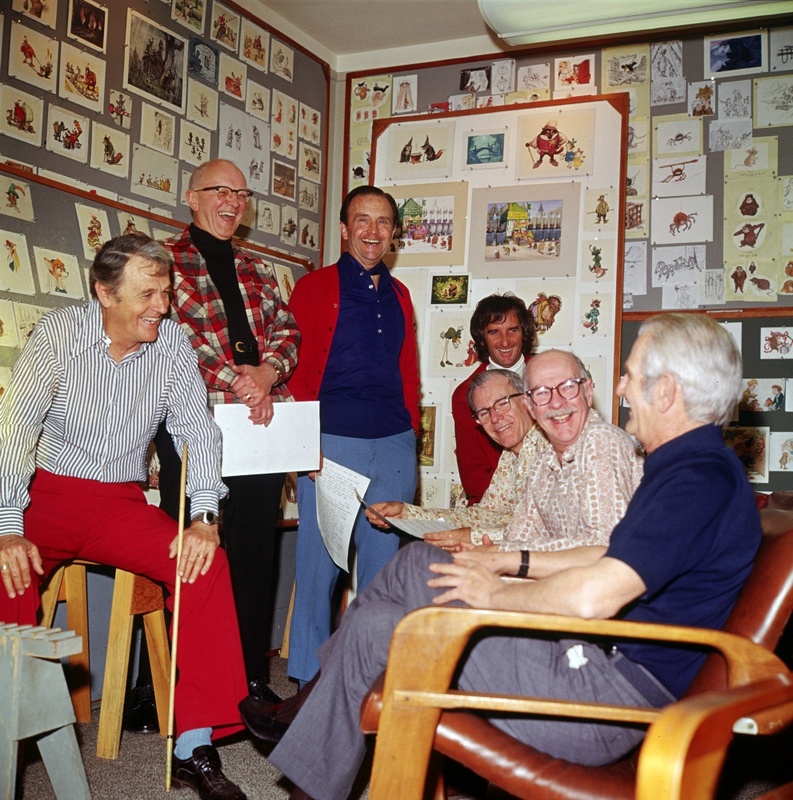 This photo was taken during a lively meeting which included, from left to right, director Woolie Reitherman, Milt Kahl, Ken, Dave Michener (a former assistant to Kahl, who had moved into story), Frank Thomas, Ollie Johnston and writer Larry Clemmons. 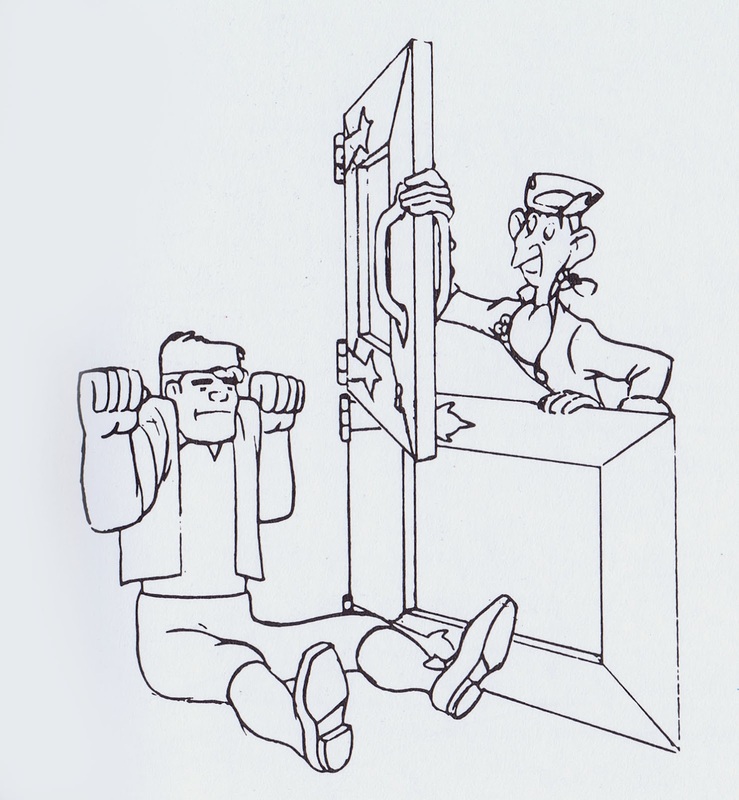 As you can see in the back Ken had done a ton of work. 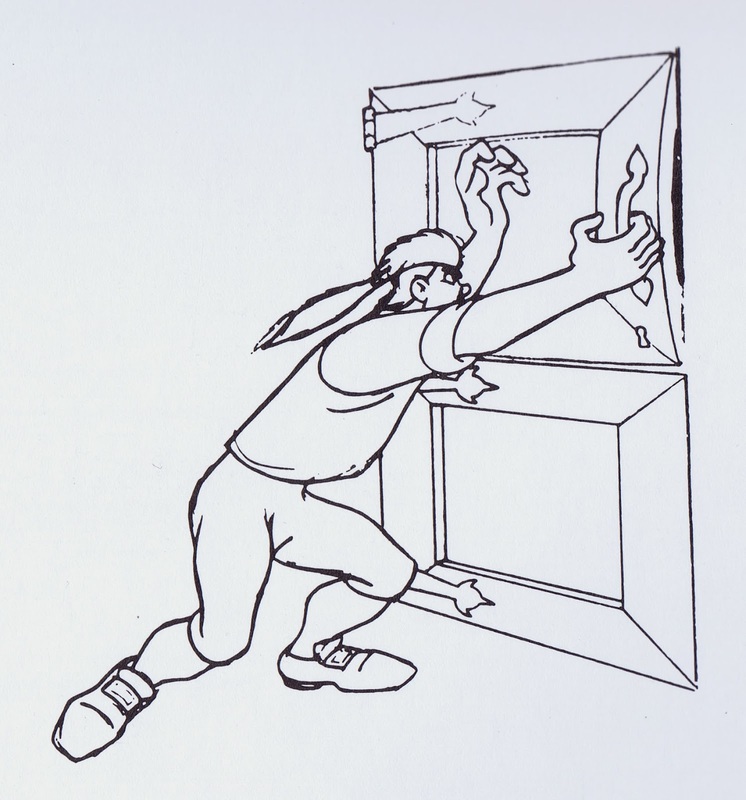 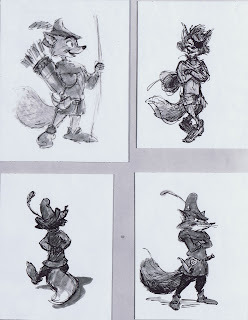 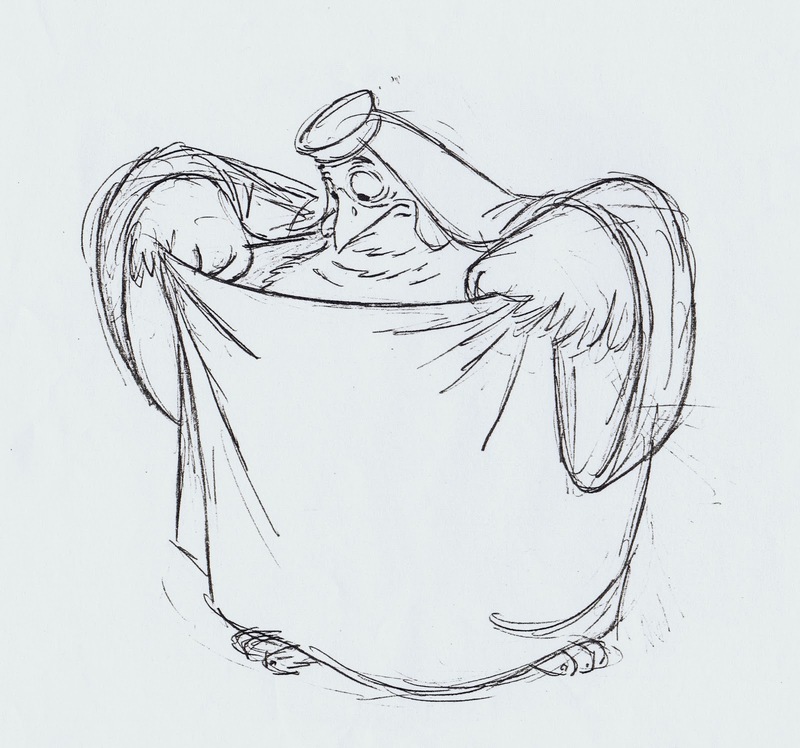 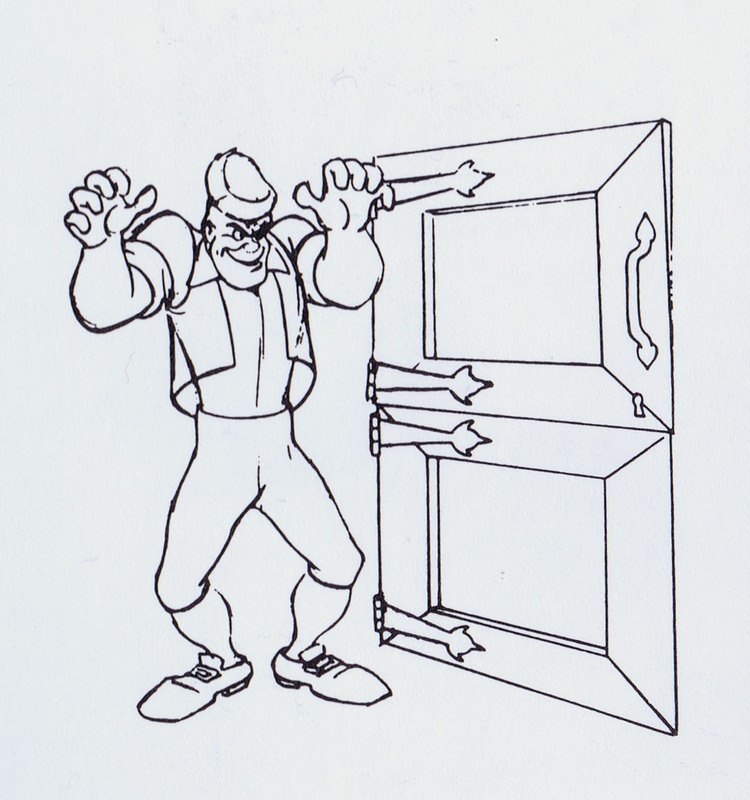 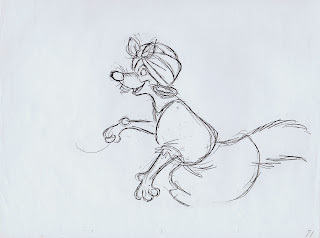 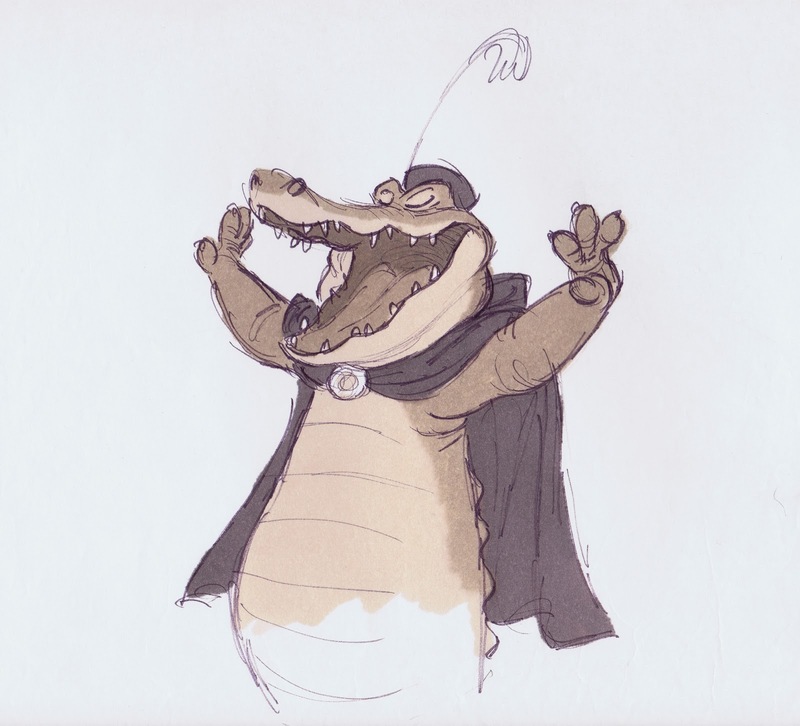 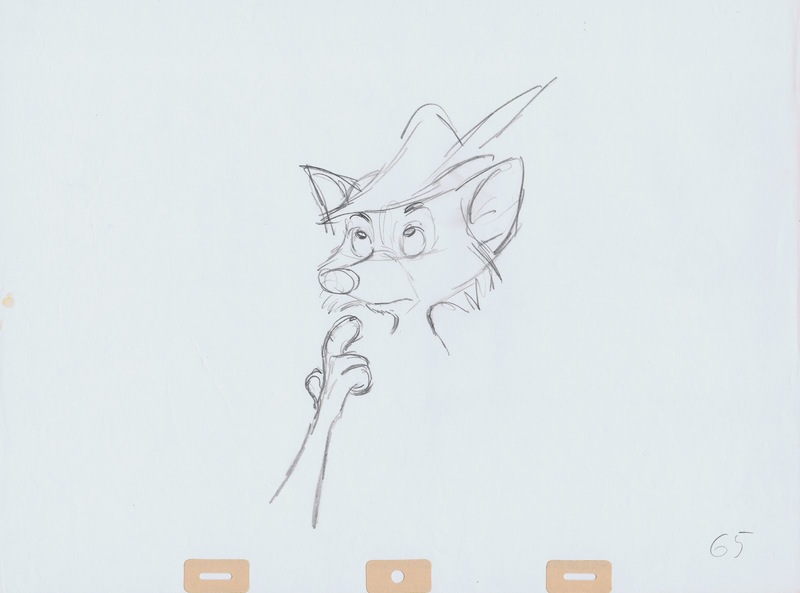 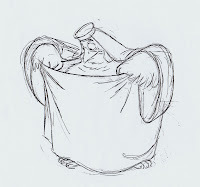 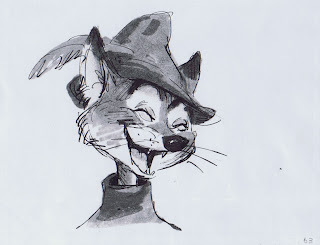 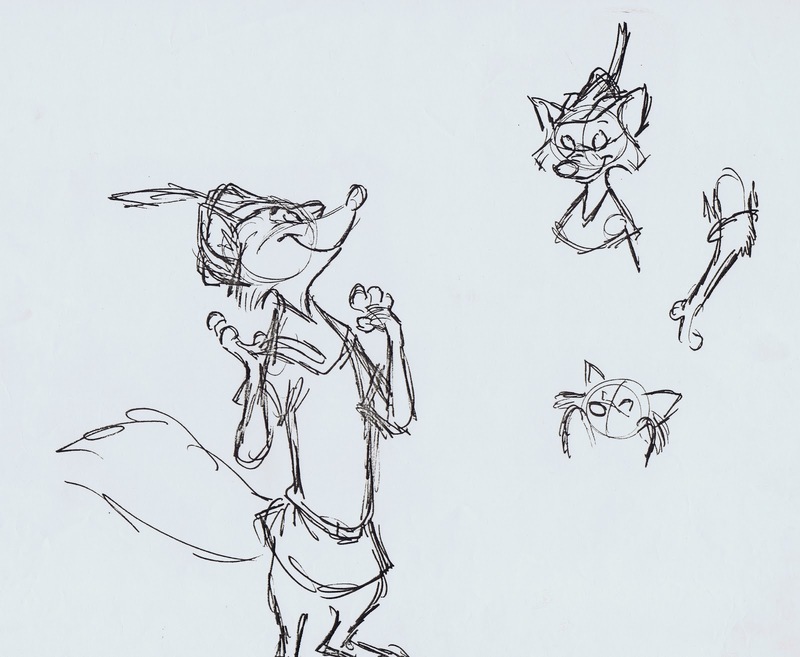 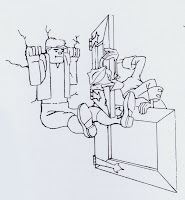 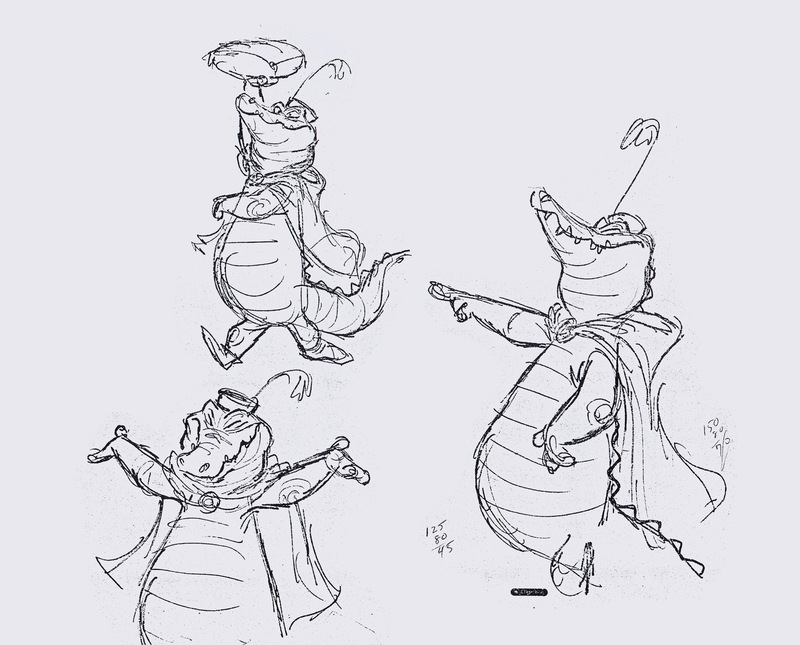 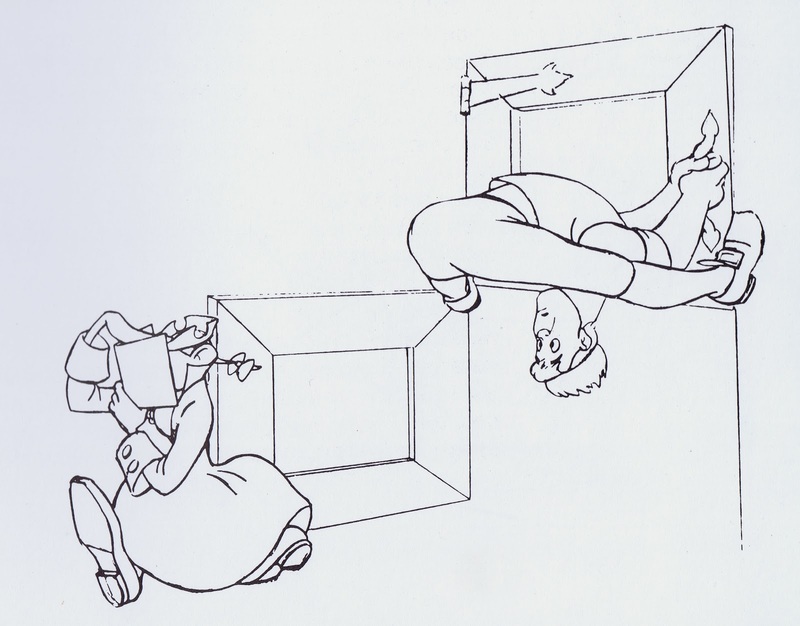 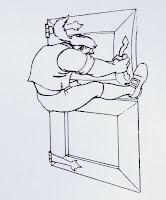 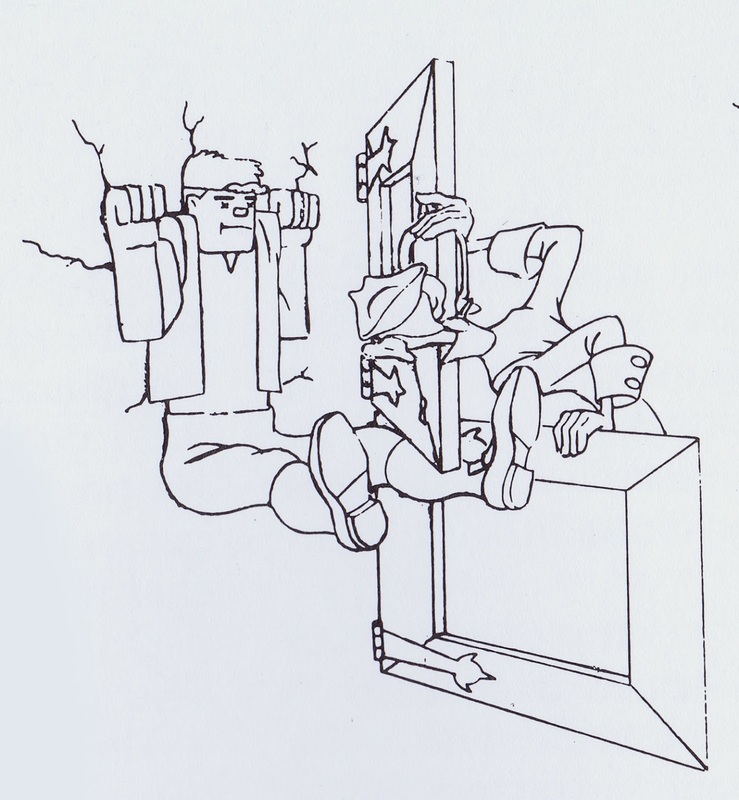 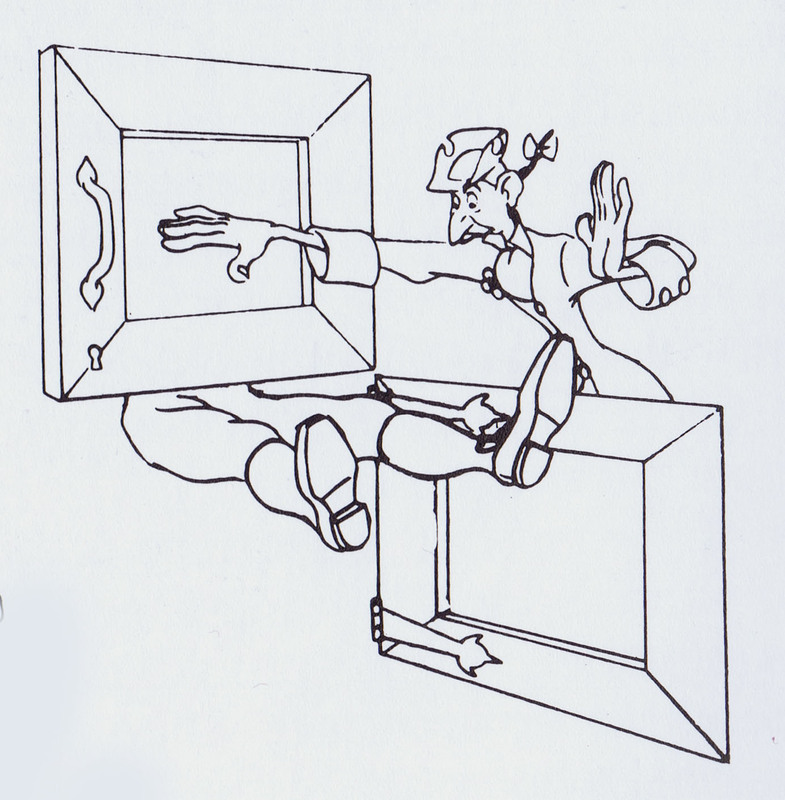 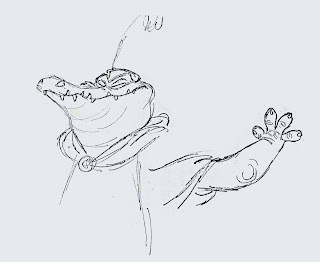 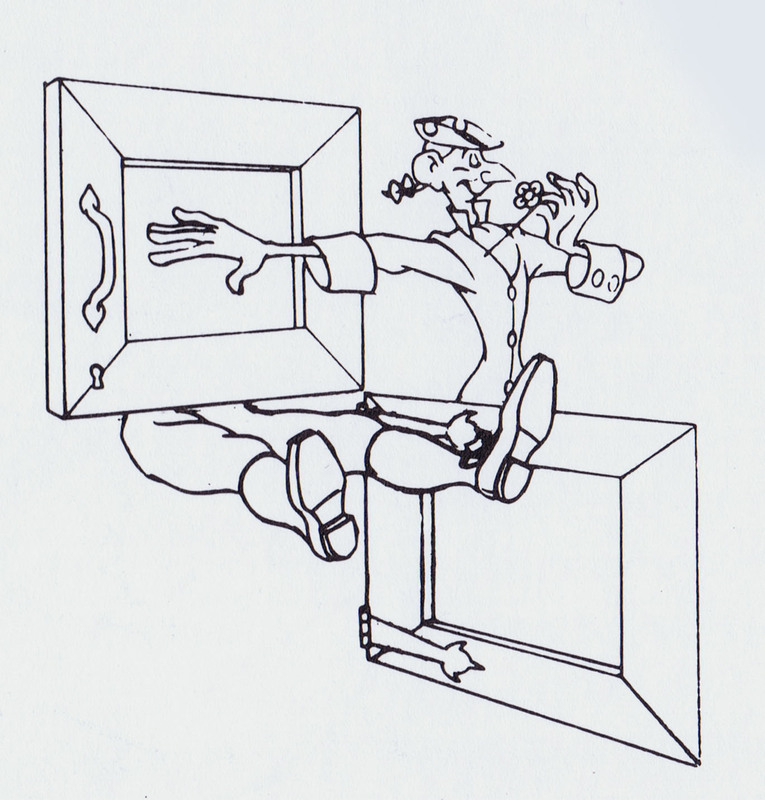 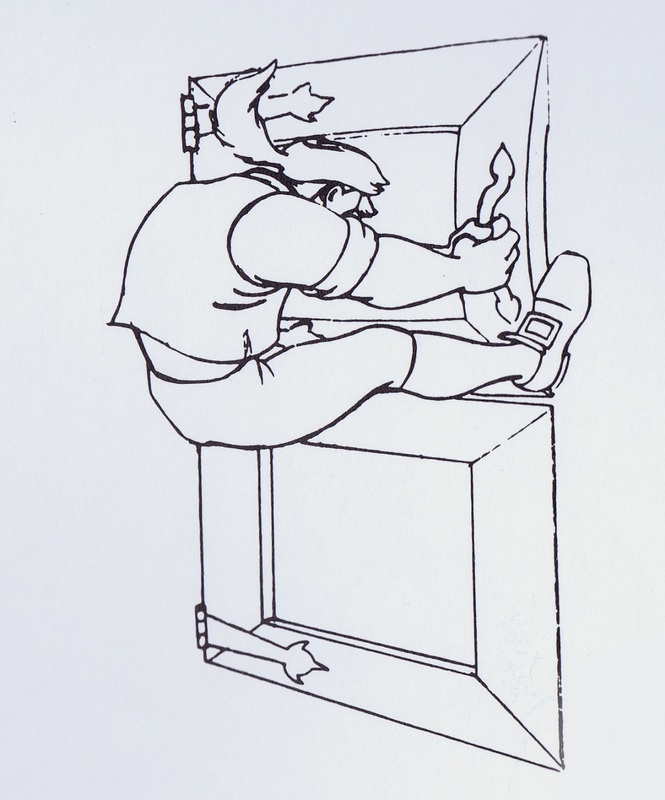 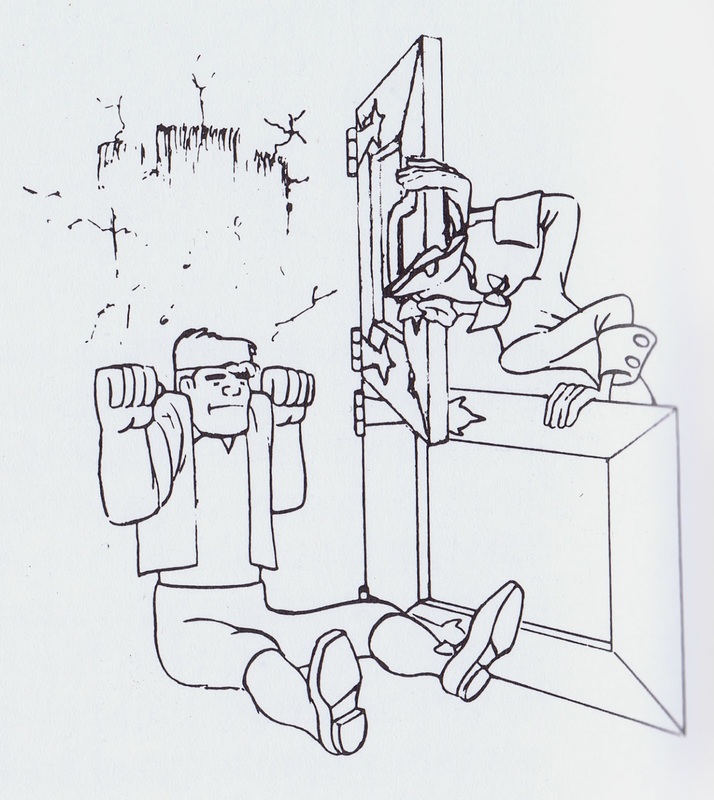 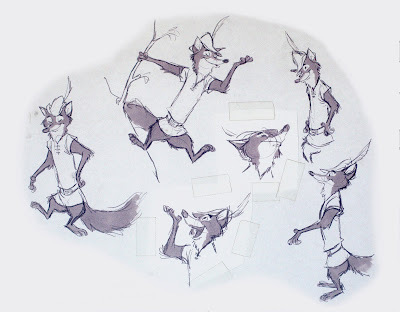 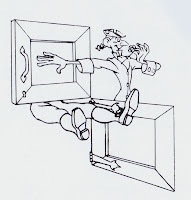 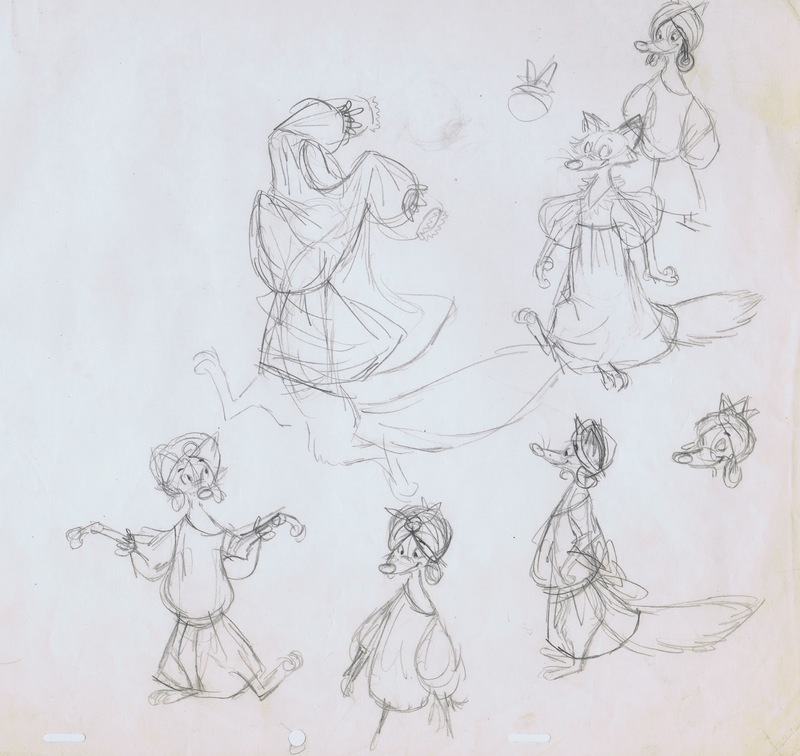 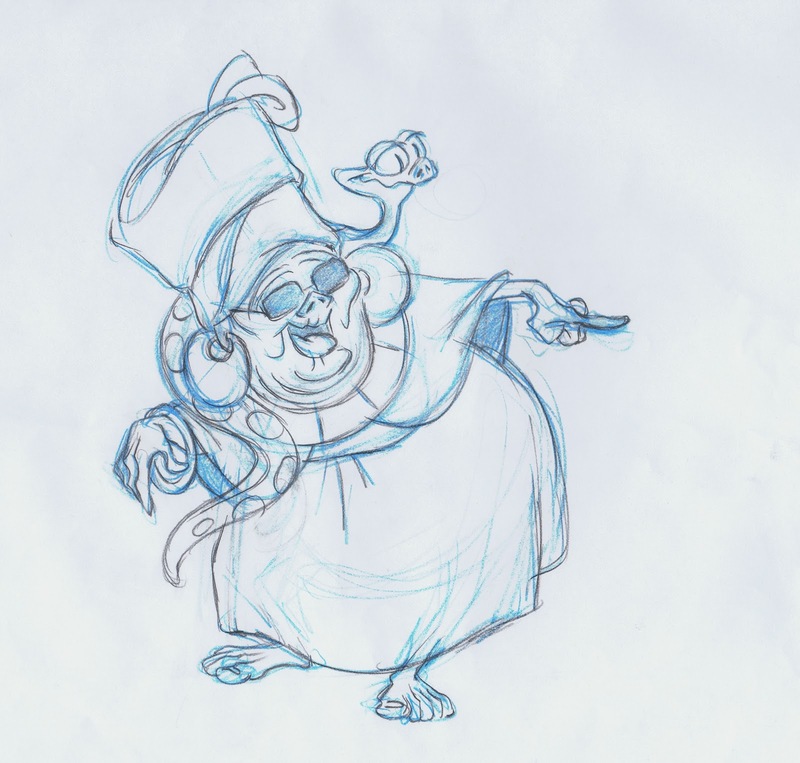 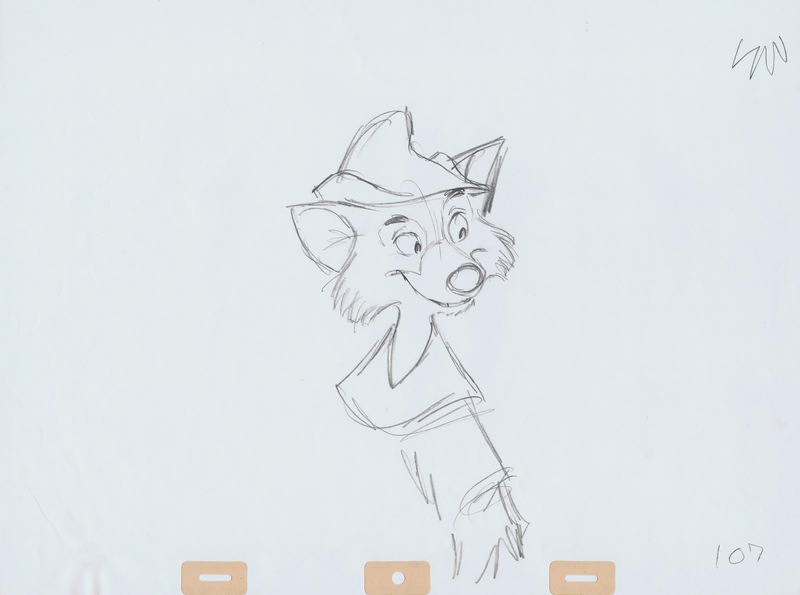 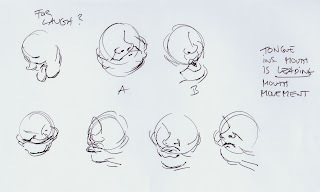 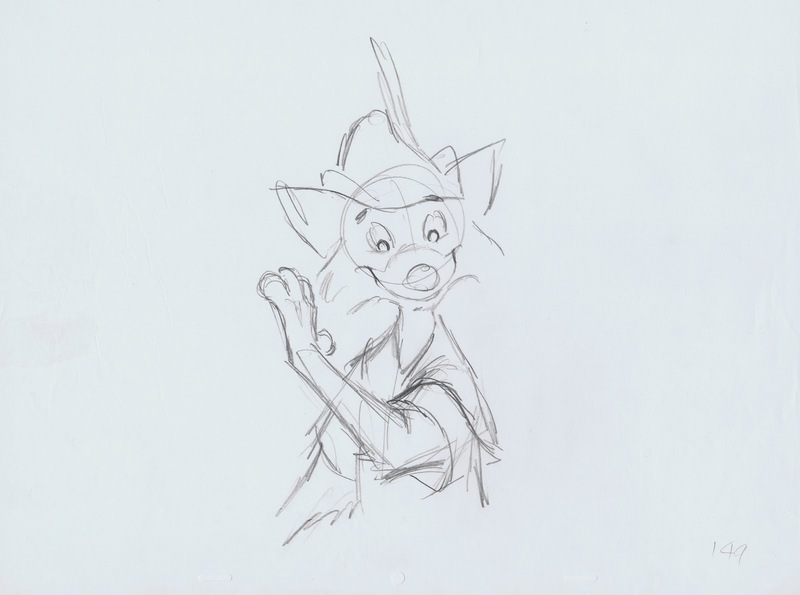 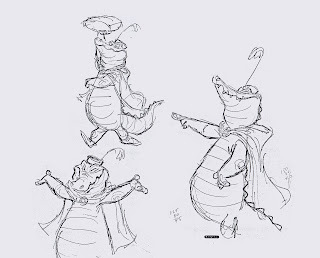 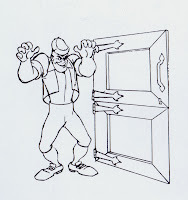 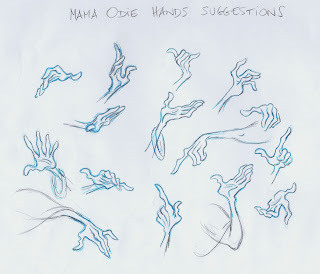 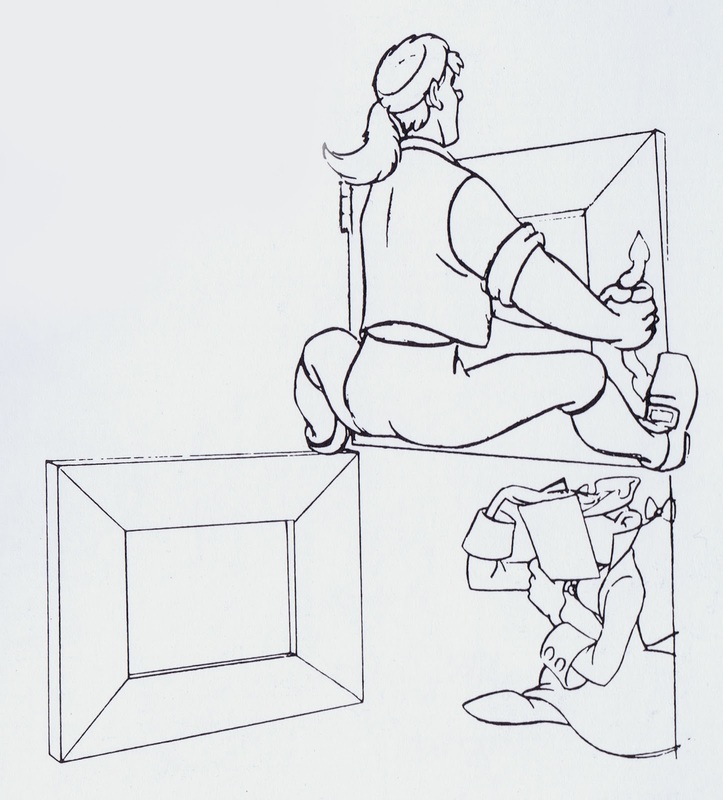 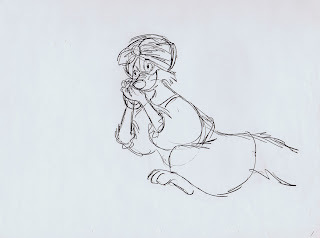 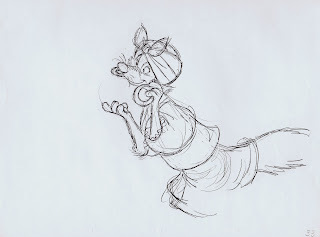 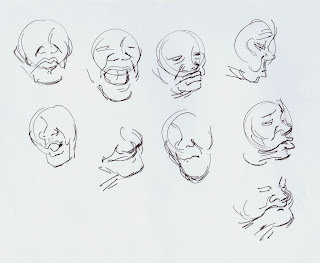 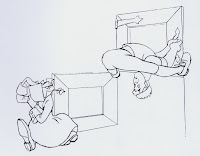 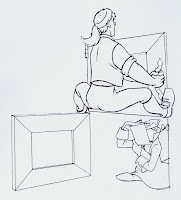 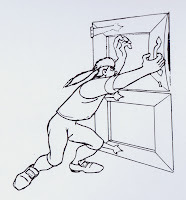 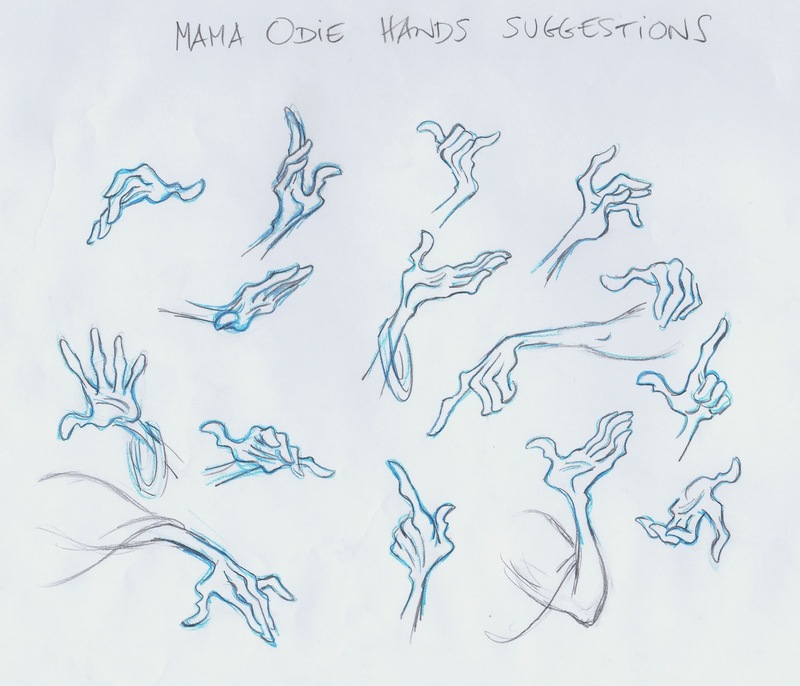 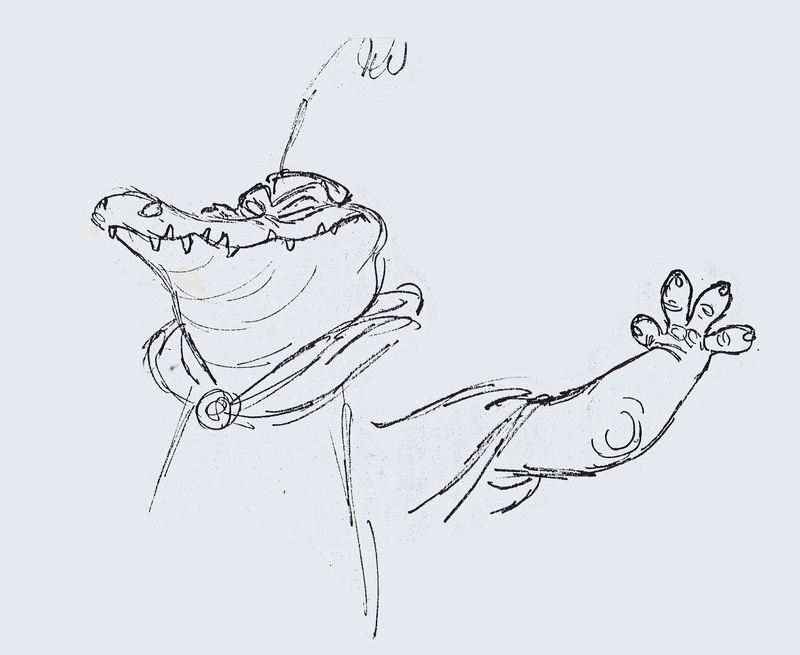 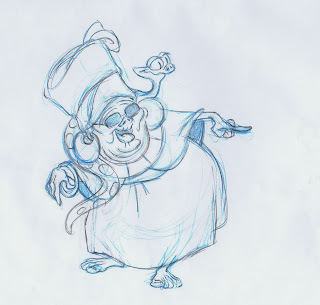 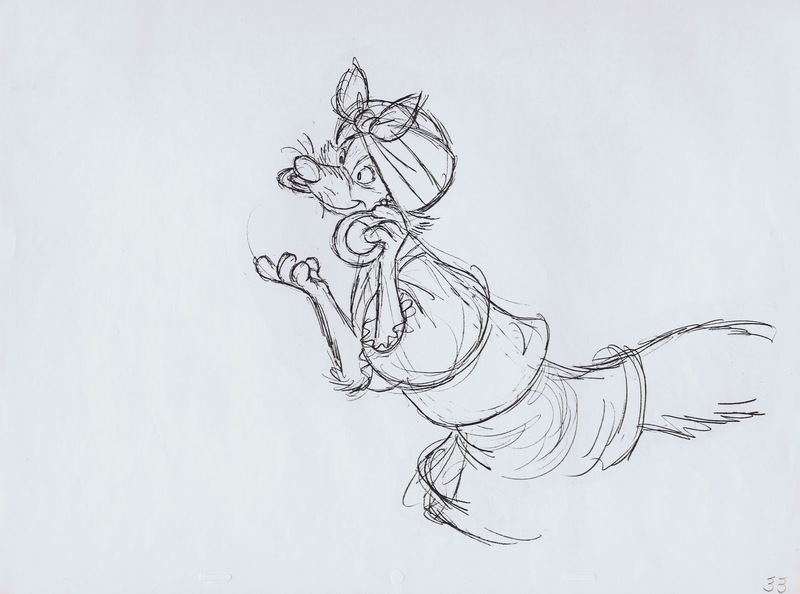 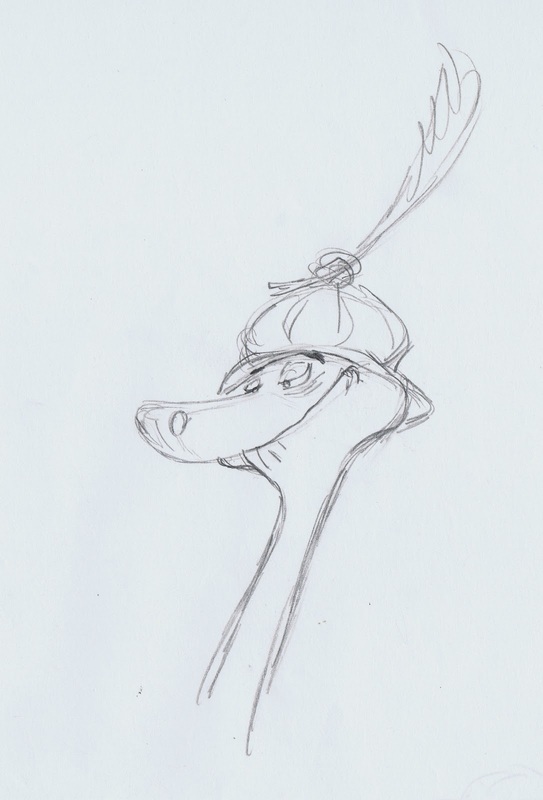 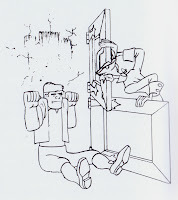 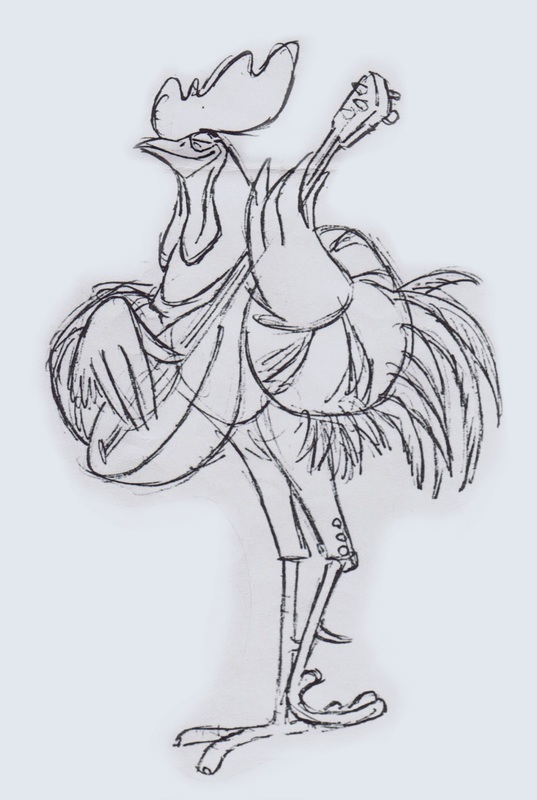 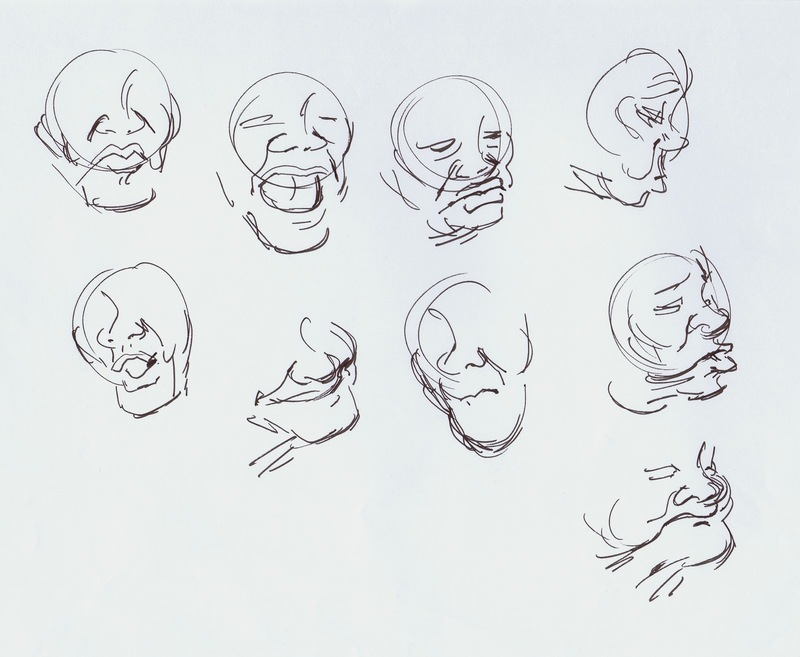 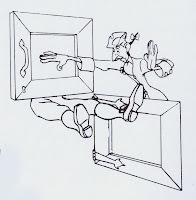 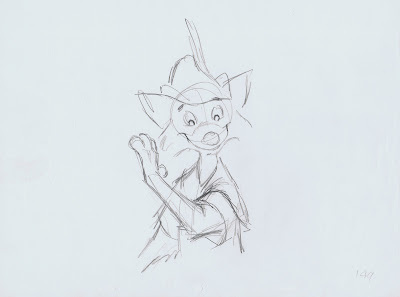 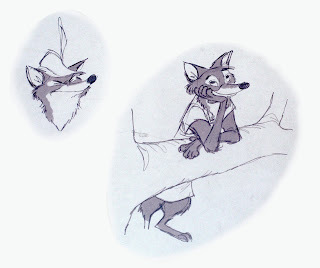 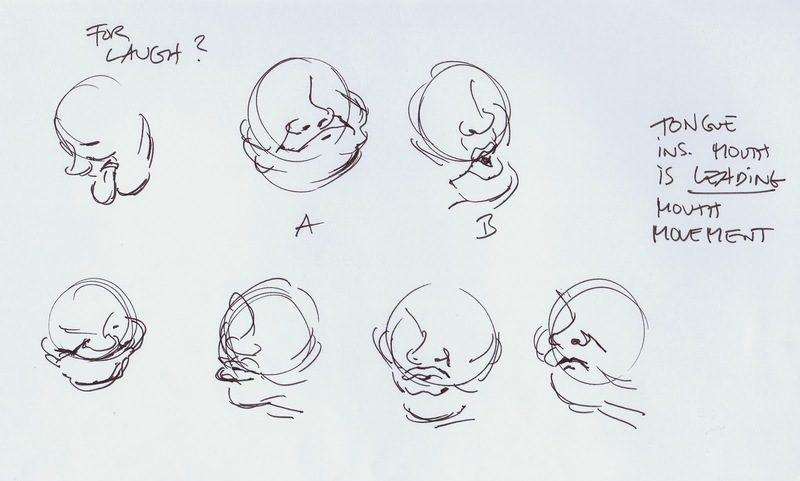 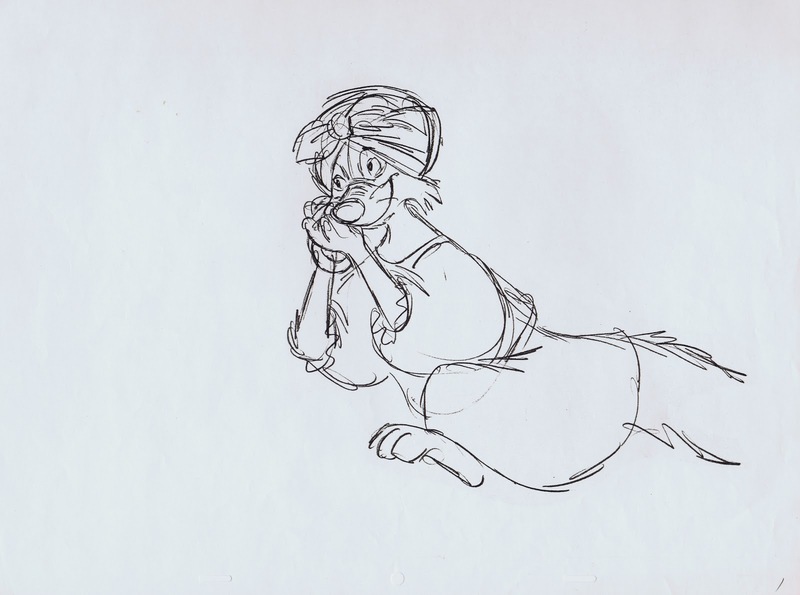 Once a character concept had been approved, it was up to Milt Kahl to finalize Ken's designs for animation. Usually Milt greatly finessed the look of the characters, but in my opinion there were exceptions. 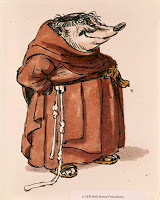 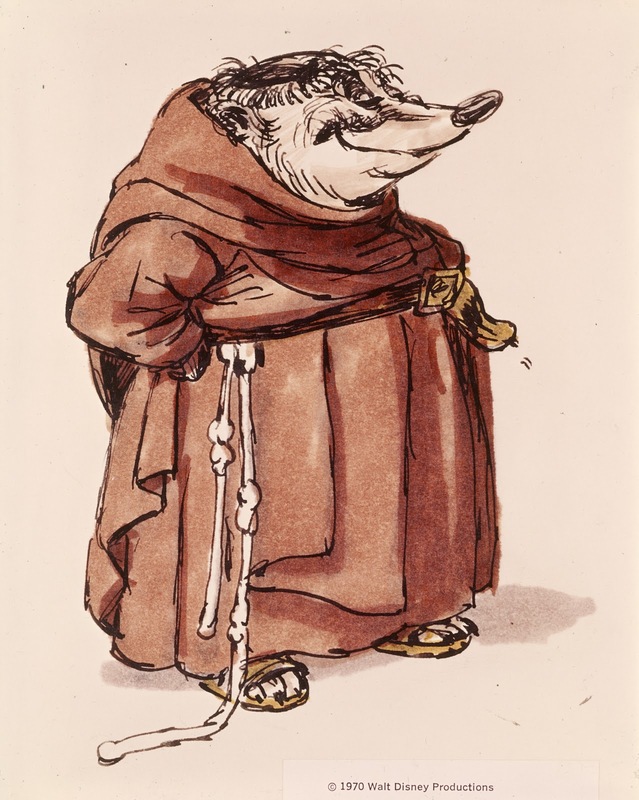 Ken's version of Friar Tuck really looks like a badger. 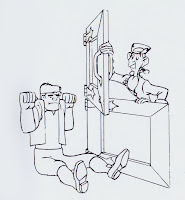 Something got lost in Milt's translation. 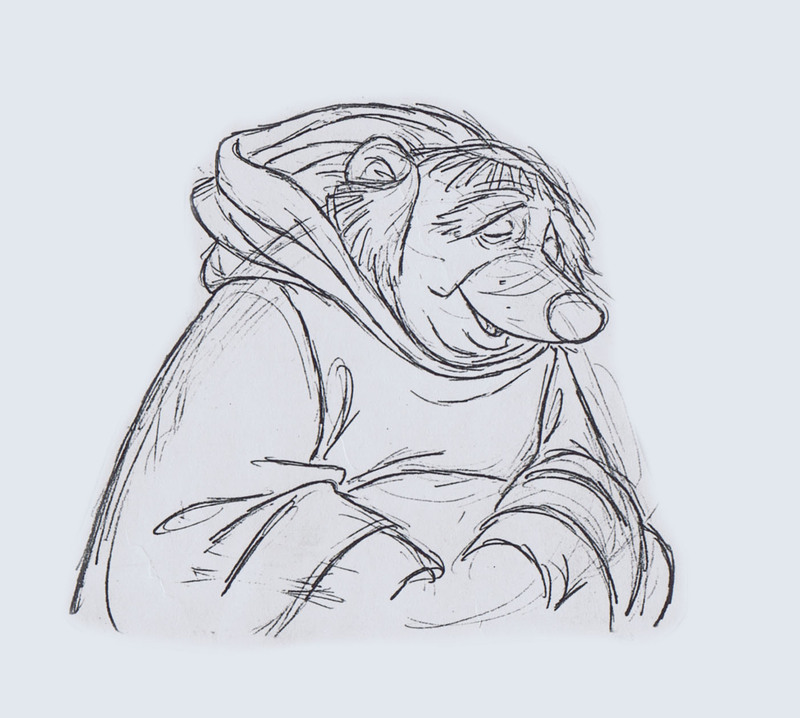 I remember that some people thought he was another bear. 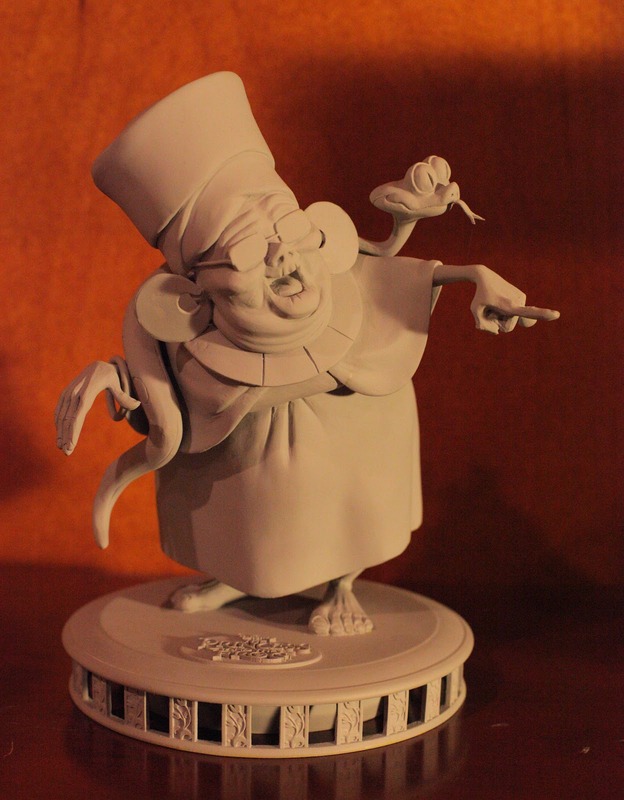 Allan-a-Dale looks fantastic in Milt's final version. 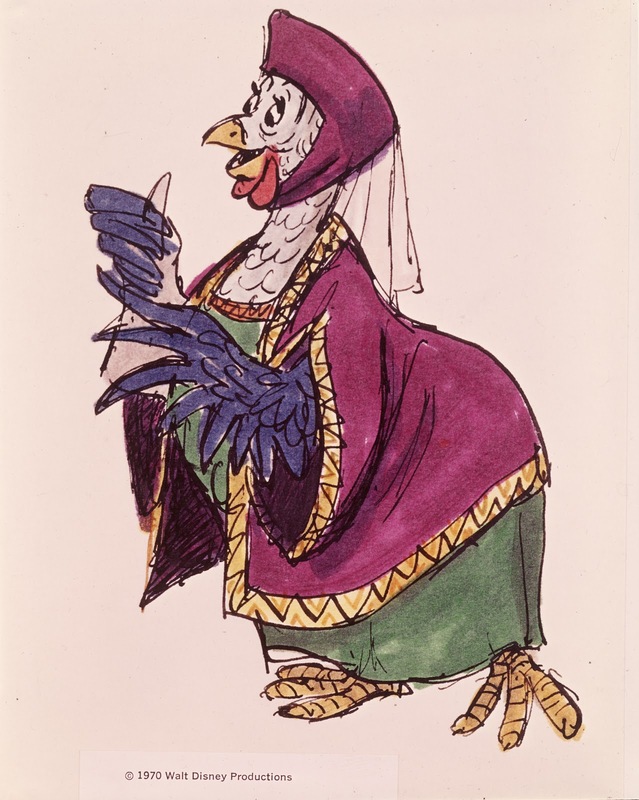 Lady Kluck is a Kahl masterpiece. 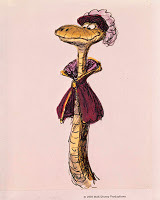 Sir Hiss didn't improve from Ken's concept, Milt's version looks a little conventional. 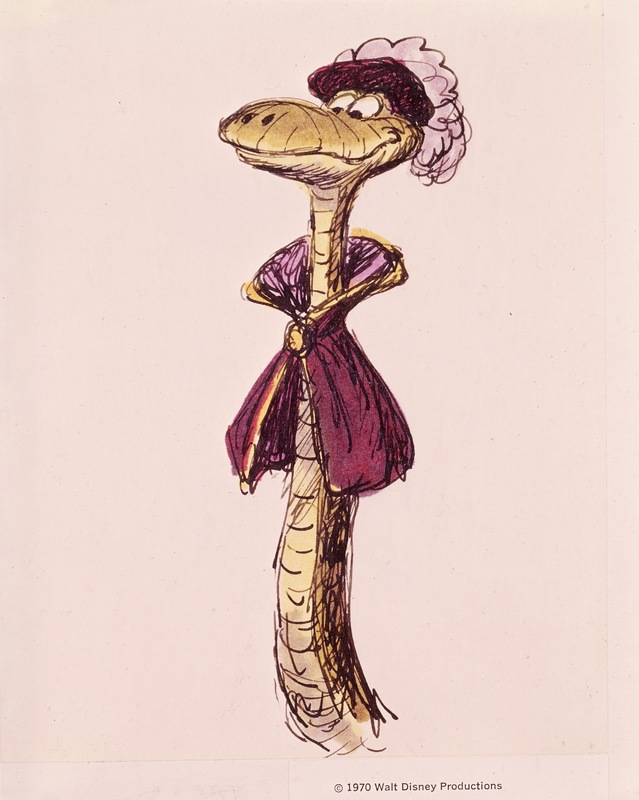 Ollie Johnston though did a great job animating the snake. 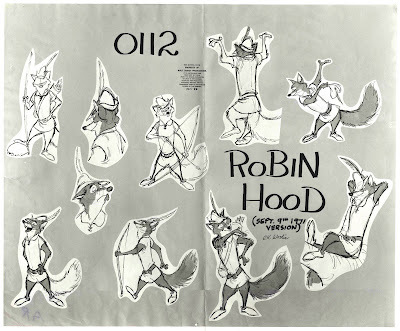 Let me know if you'd like to see more of Robin Hood's design work. 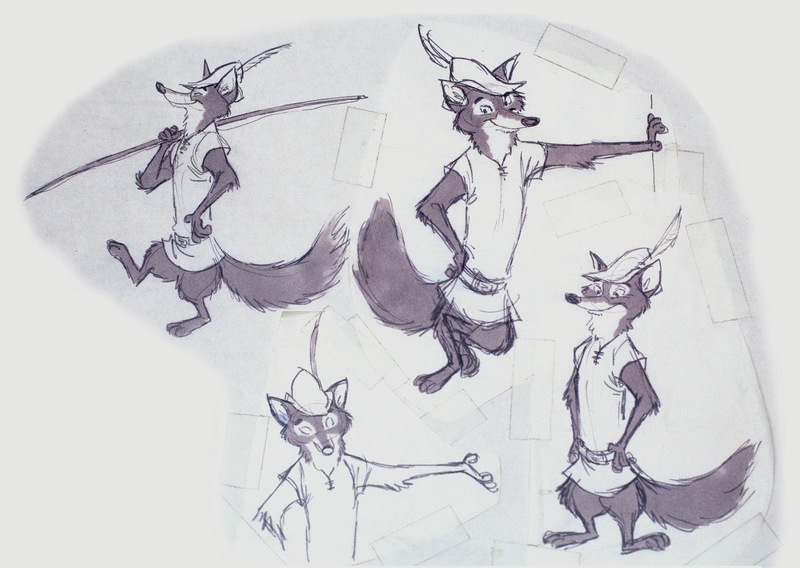 Robin, the fox himself went through quite a few changes.